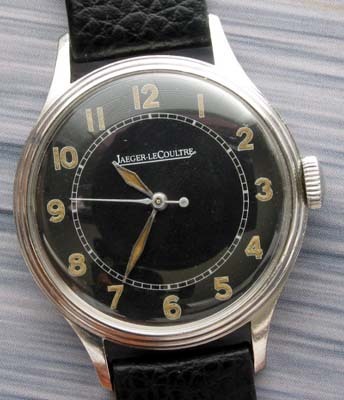 Vintage Jaeger LeCoultre dating to the 1940's. 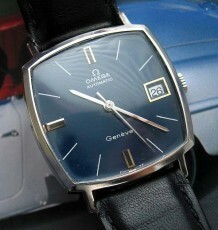 This watch is quite a handsome vintage wristwatch. 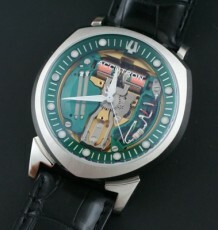 The steel case with stepped bezel is in excellent condition. The black dial, with Arabic luminous numerals, was just restored and is in mint condition. 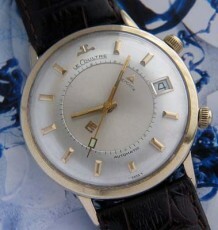 The Jaeger LeCoultre manual wind movement was just serviced and keeps excellent time. 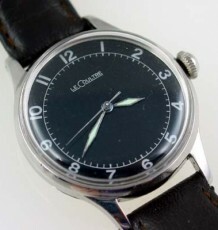 This vintage JLC represents excellent value as it reflects the best that Switzerland had to offer at the time and at a fraction of the price that it would sell for new today. The watch case measures 34mm wide by 42mm long and the watch is supplied on a new black Hirsch leather strap.